ANUPTECH LATEST SHUTDOWN JOBS / SAUDI: Shutdown Project for Oil & Gas, Client Interview in Mumbai on 27th & 28th Jan. Anuptech R-421, Midc, Rabale, Navi Mumbai. Mech. Foreman Sr. Foreman Hydro Jetter, Permit Receiver, Rigger Iii, Manhole Watch, Fire Watch, Attractive Salary, Material Co-Ordinator. All candidates required PIPE FITTERS Should contact min. 7 -10 Shutdown us directly to ACME OFFICE experience in Gulf. “ECNR” Passport holders only required with min. 1 year validity. Carry 5 passport size colour photographs with white background. I am pipe fabricator 16 years experience. Sir I am a 6g gtaw smaw fcaw.5 years exp in gulf. Sir I am data entry operator. My typing speed 65 w.p.m. my qualifications 12th pass and I.T.I. C.O.P.A. course complete with N.C.V.T. certificate. So any vacancy pls replay me my mail I.D. Project Management, Shutdown , Plant Maintenance & Procurement activities . my CV , pls forward email ID . Greetings!!! I’,vikash kumar yadav working at jamnagar as material co-ordinator. Hello consult team I have 7 experience in civil charge hand OMAN 4 YR.+3YR. AT QATAR . NOW me surching free gulf job. If have matching job (civil foreman/MASON FOREMAN) Please call me. I am scaffolding inspector and supervisor. Experience 7th years. Please send me forren country requirements. sir. i m bineet kumar chandra. 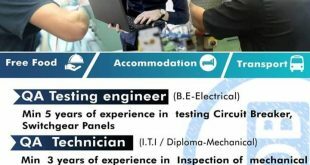 i worked at qc ( welding inspector).i have for 03 years exp. Oil ,gas petrochemical plant in piping construction field. Plz, provide opportunities piping supervisor vacancy purpose soon my Watts up no.7433832086, contact no.